The compositions and frequencies of Y-chromosome haplogroups identified by genotyping 23 biallelic loci of its nonrecombining region (YAP, 92R7, DYF155S2, 12f2, Tat, M9, M17, M25, M89, M124, M130, M170, M172, M174, M173, M178, M201, M207, M242, M269, P21, P25, and P37) have been determined in a sample of 68 Belarussians. 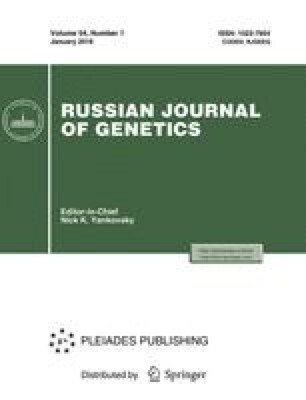 Eleven haplogroups have been found in the Belarussian gene pool (E, F*, G, I, I1b, J2, N3a*, Q*, R1*, R1a1, and R1b3). Haplogroup R1a1 is the most frequent; it includes 46% of all Y chromosomes in this sample. The frequencies of haplogroups I1b and I are 17.6 and 7.3%, respectively. Haplogroup N3a* is the next in frequency. The frequencies of haplogroups E, J2, and R1b3 are 4.4% each; that of R1* is 3%; and those of F*, G, and Q* are 1.5% each. Translated from Genetika, Vol. 41, No. 8, 2005, pp. 1132–1136. Original Russian Text Copyright © 2005 by Kharkov, Stepanov, Feshchenko, Borinskaya, Yankovsky, Puzyrev.